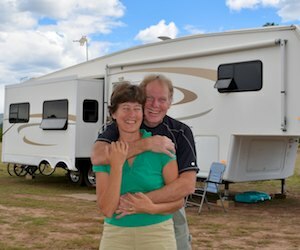 Utah is one of our favorite places for RV travel. Full of exotic, colorful rock formations, vast canyons, stunning views, friendly people and alpine forests, we have taken our truck and trailer all over the place and discovered that there is a little bit of everything we love in this state. 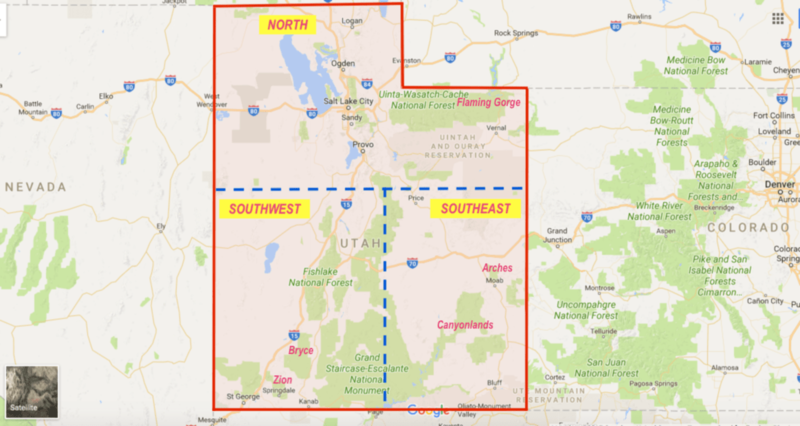 Southeast Utah – Red rocks of Capitol Reef, Natural Bridges, Canyonlands and Moab areas. The links to our travels in Utah are grouped along these lines. Click the image to view an interactive map. Flaming Gorge Utah – Vibrant Hues September 30, 2007Visiting Flaming Gorge National Park, we found bright red rock hues and turquoise-green water along the Green River. Best Friends Animal Sanctuary & Southwest Wildlife Foundation in Utah September 15, 2008Best Friends Animal Sanctuary and Southwest Wildlife Foundation are dedicated to domestic and wild animals. Bryce Canyon, UT – Fairyland of Pink Turrets August 25, 2008Bryce Canyon, a fairyland of pink and red rock spires and spikes, is one of the gems of the National Park system. Capitol Reef National Park Utah – Awe-inspiring! June 25, 2012Capitol Reef Nat’l Park captivated us with dramatic vistas at Sunset Point and Capitol Gorge plus its unique Mormon pioneer history. Cedar Breaks National Monument in Utah – Better Than Bryce? August 30, 2011Even though Cedar Breaks National Monument is less visited than neighboring Zion, Bryce and Grand Canyon, it may be more stunning! Dixie National Forest Utah – Caves and Hikes August 31, 2011Dixie Nat’l Forest has great caving at the Mammoth, Bowers and Ice Caves and pretty hikes on Bristlecone Pine & Cascade Falls Trails. Fish Lake Utah – Wildlife and Aspen Groves June 25, 2012Koosharem Reservoir & Fish Lake are rich with shore-side wildlife while Koosharem’s old mercantile offers country charm. Johnson Canyon Movie Set – A Spooky Ghost Town – Happy Halloween! October 27, 2017The Johnson Canyon movie set near Kanab, Utah, is a beautiful place to visit by day but is a haunted spooky ghost town by night! Parowan UT – Vermillion Castle and County Fair September 25, 2008Parowan, Utah is home to the “Vermillion Castle,” a beautiful red rock formation, and hosts the Labor Day Iron County Fair. Red Canyon Utah is an Overlooked Treasure September 2, 2011Red Canyon is often missed because it’s on the way to more famous Bryce Canyon, but it’s well worthy of a stop! Zion NP, Kodachrome Basin & Snow Canyon, UT – Great Red Rocks! October 31, 2007Zion National Park’s and Kodachrome Basin’s cliffs awed us while nearby Snow Canyon was ideal for hiking & biking. Goblin Valley, UT – Where the Ghosts Are October 16, 2007Goblin Valley, Utah, is an exotic, evocative landscape filled with red rock creatures and a brilliant night sky full of stars. Mexican Hat, Utah – A Special Hoodoo in the Red Rocks April 5, 2019Mexican Hat is a unique red rock hoodoo formation and riverside village we visited in our RV trip across southeastern Utah. Natural Bridges National Monument & Utah’s Bicentennial Highway June 15, 2012Natural Bridges National Monument has three unique natural rock bridges and Utah’s Bicentennial Highway is spectacular! San Rafael Swell, UT – Pictographs & Dinosaur Prints October 12, 2007The San Rafael Swell has all kinds of petroglyphs and pictographs, and even has a fossilized dinosaur footprint! Traces of Antiquity and the Not-So-Ancient in Utah! March 29, 2019On an RV trip in southeast Utah we found a pictograph from a thousand years ago and petroglyphs from a few decades back.